Need somewhere to keep your little one safely nearby, but out from underfoot during your busy day? 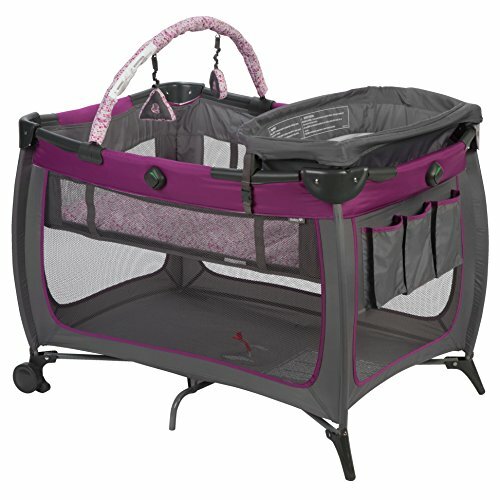 The Safety 1st Prelude Play Yard is the perfect place for your baby to play and take those much-needed naps. Theres plenty of room for them to play, and its large enough to keep them happy as they grow. Each Prelude Play Yard also doubles as a changing tablea great space saver that lets you do a quick diaper change right when they need it. With the elevated changing table attachment and convenient accessory tray, you can have everything within arms reach. The elevated platform is sturdy and secure and includes an easy to clean surface that wipes down easily. Mobility is also made easy thanks to the on-the-go carry bag. Simply fold down the play yard and pack it into the bag when youre traveling. The play yard also includes a removable toy arch with engaging toys to help keep them entertained. The Safety 1st Prelude Play Yard boasts a full-size bassinet thats perfect for newborn naps and allows you to keep a close eye on your baby during those precious first months. ROOM FOR NAPS AND PLAY - The Safety 1st Prelude Play Yard has plenty of room for your little one to nap and play. It's also large enough that they won't grow out of it too soon! DOUBLES AS A CHANGING TABLE - This play yard also includes a changing table, letting you save room around your home. A handy storage area on the side keeps everything within arm's reach during diaper changes. EASY TO MOVE AND TRAVEL - On the move? Features an on-the-go carry bag for a packable play yard that's easy to take along on trips. KEEP LITTLE ONES ENTERTAINED - This play yard also includes a removable toy arch with engaging toys to keep your little one happy and entertained.